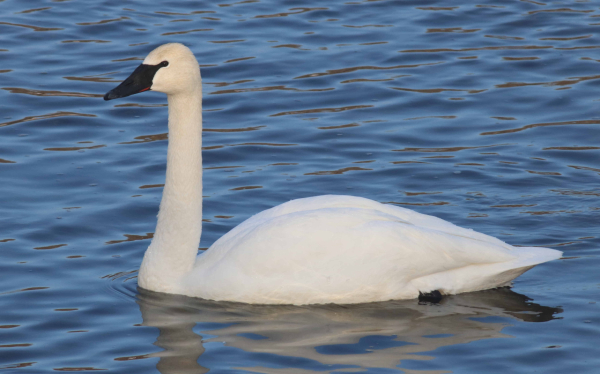 A wayward Trumpeter Swan has been attracting birders at Milford Pond (a large lake) in Milford, Massachusetts since it was found January 28. Last week’s most wayward birds included a Gray Kingbird south of New Orleans, two Bramblings in Minnesota, a Barnacle Goose in Rhode Island and another in New York, and yet another Golden-crowned Warbler in southern Texas (the third reported this season). Other exciting off-course birds included an Arctic Loon offshore northwest Washington state, a Lazuli Bunting that continues to visit a feeding station in Ottawa, Ontario, and a couple Varied Thrushes – one in New York and another in Michigan. There is more to report, so read on! Previously reported rare birds that continue to be monitored by birders include the Long-legged Buzzard on St. Paul Island, Alaska, the Yellow Grosbeak in southern Texas, the Pink-footed Goose in northern Colorado, the Barnacle Goose in New York; plus the White-throated Thrush in southeast Arizona, and the Red-flanked Bluetail in Los Angeles. Special Thanks to the ABA, and Nate Swick, who does such a great job of compiling the ABA’s Rare Bird Alert, which we use to prepare this weekly replay.